A group of Muslim volunteers in London have invited the homeless and people from other communities to join them as they break their fast at sunset during the month of Ramadan. The Muslim holy month began on Wednesday 10 July, during which Muslims will abstain from food and drink from before dawn until dusk. Organisers of the Ramadan Tent are largely students and alumni of the University of London’s School of Oriental and African Studies (SOAS) in Bloomsbury, central London. 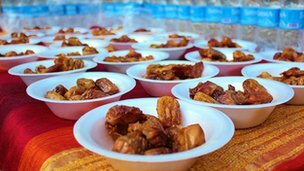 The university is being used as the site for the Ramadan Tent where iftar, the sunset meal, will be served. The Ramadan Tent was conceived by Omar Salha, a SOAS alumnus who serves as an activist in Muslim volunteer activities across Britain. 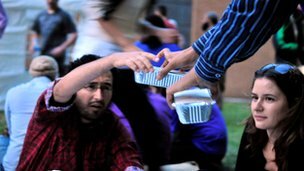 He had previously organised an iftar gathering in 2011 for SOAS students, where participants gave out meals to the homeless in Lincoln’s Inn Fields, a large public square in Holborn, central London. This experience spurred Mr Salha to create a more organised campaign this year for the entirety of Ramadan, with the support of individual donors and various restaurants. He said it was important to remove the negative portrayals of Islam and for Muslims to understand how to contribute positively to London. He said: “We want this Ramadan campaign to challenge some of the misconceptions people have about Islam. “But it’s also about connecting with all communities on a more humanistic level. Mr Salha said this spirit included seeing to the needs of London’s homeless, who were often ostracised by society. This was why the campaign reached out to organisations such as homeless charity St Mungo’s. “Some residents from St Mungo’s saw our advert in their residence and came,” said Mr Salha. The Ramadan mood has also drawn in non-Muslims, such as students Alyna Rogow and David Muller. “I already knew eating dates was important,” said Ms Rogow, who lives in the US. Mr Muller, who is from Switzerland, said: “The event has allowed people to access a belief and culture that may be alien to them. Mr Salha said he hoped the campaign would grow and have a presence in important London landmarks.